Iowa's first rail-trail can be found only 80 minutes south of the Des Moines metro. The Cinder Path is 13.5 miles in length and travels from Chariton to Humeston. Leave the road bike at home as this unpaved trail has a mixture of terrain consisting of cinder, limestone, gravel and even grass. Scenery consists of forest, wetlands, and the Chariton River. There are no facilities along the trail, so pack and plan accordingly. The Cinder Path has been on my "to-ride" list for several years. This would be the day I'd be checking it off! After a quick pit stop at a gas station outside of Chariton I parked at the trailhead and prepped for the bike. I had borrowed my son's mountain bike since the trail is known for being rough. His bike is a bit small for me but not uncomfortable. I had a seat bag holding repair items but didn't have a handlebar bag for other essentials. As a work-around I brought along a draw-string bag to carry a snack, tire pump, car keys, wallet, phone, and bandanna. It worked great. Only yards from the parking lot is the first bridge of many. I'm not sure why signs instruct riders to walk bikes across. Perhaps it's because the boards get slick when wet. Maybe it's because some of them have wide gaps between the wooden slats. I threw caution to the wind and slowly rode across. 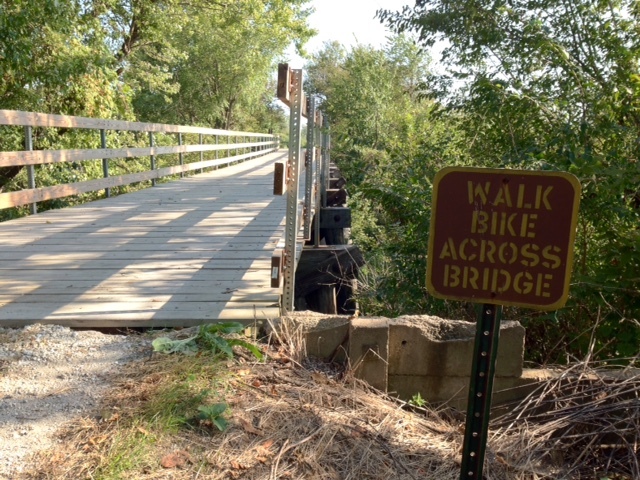 With over 15 bridges on the trail dismounting for every one would certainly get old. The trail was is great condition. I was anticipating it being rough and narrow. It was quite the opposite. A wide trail and a smooth ride was a nice surprise. In my opinion, the Cinder Path is smoother than the northern unpaved portion of the Chichaqua Valley Trail! 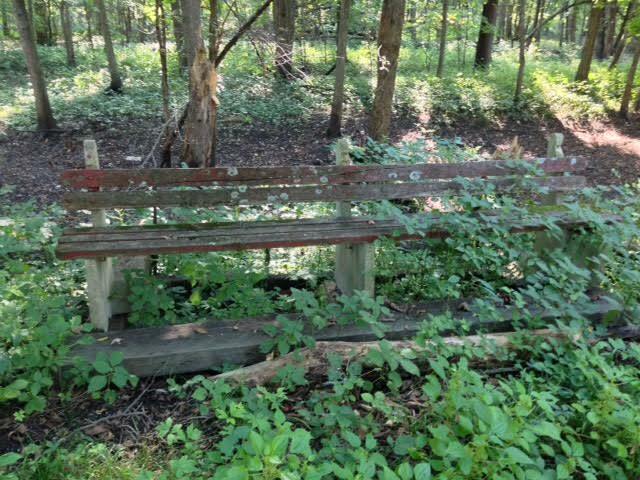 Trailside benches and structures were needing attention. Many were overgrown with vegetation and did not look structurally sound. They did a great job of adding interesting character to the trail. Hunting is not allowed along the Cinder Path. By the amount of squirrels I saw it's their hangout during squirrel season. They have plenty to eat with all walnut trees shading the trail. The wooded corridor made for a serene ride and a refreshing change from the busier central Iowa trail system. This would be an ideal trail for enjoying fall colors and a fun spot for winter fat biking or cross country skiing. Almost 7 miles in I spotted two large dogs running towards me. If I wasn't riding solo I would have ventured ahead hoping they were friendly. But, alone on a trail in the middle of nowhere, and a bit scared of dogs, I didn't want to chance it and turned back. I was followed for a bit until they were distracted. I probably have a fat squirrel to thank. After wrapping up my ride I headed into Chariton. My agenda for the day included a couple of stops around the town square. The first was Piper's Grocery and Homemade Candy. A Chariton institution since 1903, the store front greeted me with it's cheerful awning. Inside there was an interesting mix of groceries, antiques, deli counter, and of course handmade chocolates. I picked a small box containing a sample of their fudge, pecan roll, and turtles. Warning!! Do not leave this store with a small box!! It's not enough!!! Next stop was the Connecticut Yankee Pedaller. This bike shop is located inside a former movie theater built in 1927. What was once a balcony filled with seats is now lined with bicycles of every type. Name it, and the Hendricks family has got it. Even penny-farthings! I drooled over a sporty orange trike an it's cool set of wheels. This might have to be my next bike. I can picture it now: Zipping down the trail on this tough trike while eating the big box of Piper chocolates and being tailed by a couple of dogs.